Dragon Age: Origins is the first game in the Dragon Age series and is available on Windows, Mac, PlayStation 3 and Xbox 360. The game is played with a third-person aspect and takes place in a fictional fantasy game world. In Dragon Age: Origins players take control of their own mage, warrior or rogue and explore the kingdom of Ferelden. Players can choose to have a human, dwarven or elven background giving you some customisation as you mix and match your options. This customisation is extended visually and with specialisations allowing you to create a character that suits your style right from the start. Depending on your choice of race and class players will start their adventure with one of six available origin stories. These stories focus on introducing the player to the various game mechanics and are all very similar but it is a nice touch to your early game adventure. The impact of your your race/class choice isn’t limited to the start of the game though as it also permanently impacts how NPCs react to your player. Mages for example are feared by most of the game inhabitants while human warriors and rogues are well respected across the lands. After passing your origin story players team up with Duncan and attempt to recruit enough men to battle against the approaching evil. The game has all of the fun role playing game elements of similar games including side quests, levels, equipment and companions. All of these features have plenty of meat on their bones for RPG fans to experience. Players can also drive the story towards good or evil based on the decisions that they make during the game. 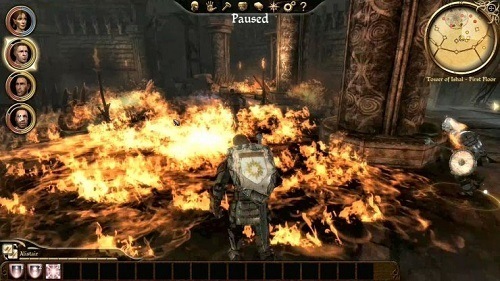 Companions play a large role in Dragon Age: Origins with players being able to develop their own party as they progress through the game. Players can give gifts to their party members to increase their loyalty and open up new dialogue if they want. On the other hand if you make decisions that go against their morals they may leave your party or even turn on you. Dragon Quest: Origins has all the features RPG fans would want to see in a game and all of them are nicely presented. The party politics in particular create a more realistic game as you adventure with your party members. Plenty to do in the world of Ferelden. Mix and match your desired class/race combo. Experience six different origin stories to help give you a place in the game world. Play the way you want with evil, good and grey decisions. Lots of side quests to complete to give you hours of gameplay.